We have all experienced the difference between what we expect and what we actually experience. Sometimes reality falls short of the setup while other times it goes far beyond what you felt it would be. At times, it will even be exactly what you thought would happen. I have experienced each of those situations often in my life. Thinking about reality matching expectations, many of my jobs fit that bill. You know the job requirements before starting, and some of the responsibilities are harder than your thought while others are easier. When all is said and done, it all balances out to be what you knew it would: sometimes boring, sometimes stressful and sometimes fun. When it comes to reality falling short of expectations, a vacation can do that. You hear about someone's trip and how incredible it was; the weather, the sites, the scenery, the people and the memories, and you want to have all that in your life. Then you go, and the weather stinks, or the attractions were closed. A member of your traveling group gets ill or hurt, or you eat at a recommended restaurant and receive poorly cooked food with even worse service. You had hoped to have wonderful memories on the plane ride home, and for years to come, but instead it's one rotten tale after another. 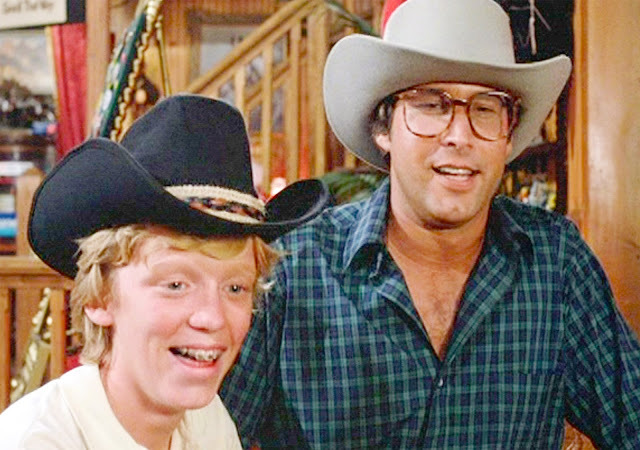 And no cool hat, either. Lastly is the best, when the reality far exceeds what you expected. My best memory of this was my first trip to a ball game. I don't remember if it was 1972 or 1973, but I know it was a bright, cool day with a trip to Comiskey Park. I had watched plenty of games on the tube and finally I was getting to see a game in person. 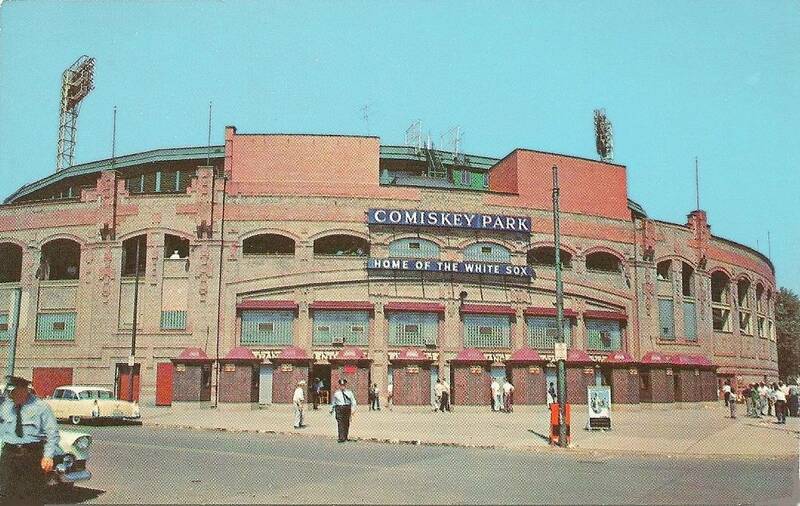 While Comiskey was an amazingly beautiful park when built, they painted the outside brickwork white, so seeing the park for the first time didn't overwhelm me. It was fun walking through the concourse, up the ramps to our seats in the upper deck. We found our section, walked through the opening and that's when it finally hit me. It was SO GREEN! And huge! The field was small on the 19" console color Zenith TV. But in person, it was this sea of beautiful green grass, the alternating shades from the cutting. I remember being in such awe in my seat looking at the enormous expense of Comiskey to my 7 or 8 year old body. I'm not sure what I expected when I as first told we were going to the game, but I can tell you I was blown away with the experience. Another similar experience came in recently from Mark at My Best Friend collects Chipper Jones. Mark said he has gone through all his vintage an offered up a stack for my 1964 set. And it was offered with a condition of "you can help me in the future". When the box arrived, no matter what I expected a stack of '64s would look like, I was still blown away with the gracious action. And as I sort through the box, the gifts keep coming out. A total of five cards for the current year's release. That Eaton is almost the perfect image, but even if it was pulled back, it wouldn't work. 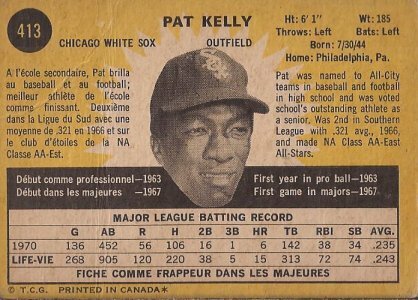 There was one more card that didn't make this scan from the '66 set. And the bent corner Kelly is no ordinary 1971 card. O Pee Chee! These cards were unexpected in the box of 1964's Mark sent. And how many? How about 113? 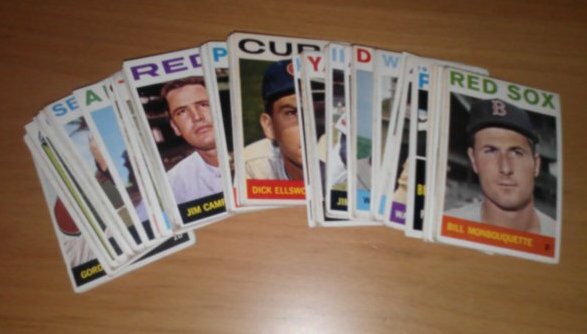 Yes - 113 cards for my '64 set. Mark went through my checklist and all but 6 were needed. And here's the thing. I didn't know I had those six. I forgot to remove them from the want list. 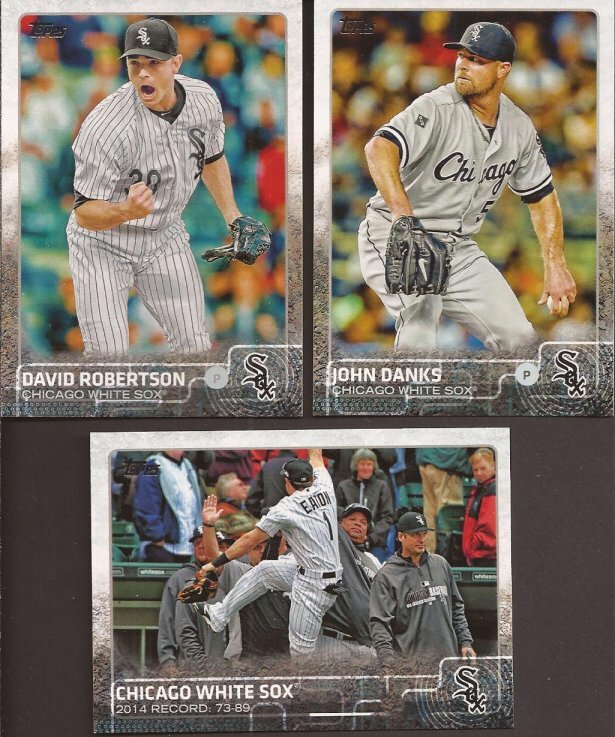 Mark's cards, though, were all upgrades on the ones I had, so all was not lost. Among all the common-ish players, though, are some star players, as a 2nd year Rusty Stuab and Yankee star Pepitone will attest. Plus, I am following the rules of posting any Mossi card received. Haddix is competing with Mossi for the MVD award - Most Valuable Dumbo. Mark's generosity bumped my 1964 set from 46% to 65% complete. I actually have enough now to put them in binder pages. Plus, I now must be more selective if I buy lots because odds state I may have more than half of the cards in the group. Mark, I look forward to your lists and hitting the boxes at my LCS. 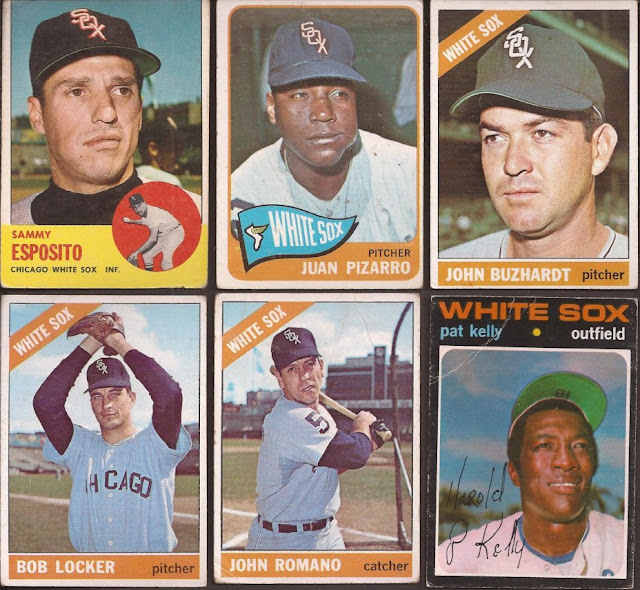 And I'll throw that offer out to anyone - if you have a list for a set from the 50's-80's, send it over to me. I can see what I find. Forcing me to spend time at my LCS - good for you, maybe not for my marriage. Freehan looks like he's in someone's back yard. That Haddix has always reminded me of the freckled MAD Magazine guy. Ha. I thought the same thing! I had that same reaction the first time I went to old Yankee Stadium when I was 12. I was shocked by how green the grass was the first time I saw it.